Soca music has brought joy to millions of people at Caribbean carnivals throughout the world. 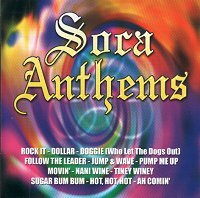 Soca Anthems, from Smokey Joe Productions, captures twelve of the most popular Soca tunes ever recorded. Penned by one of the Caribbean's top songwriters, Dennis Williams (aka Merchant), "Rock It" broke into the British national charts in the 80's after being a massive hit in the Caribbean. (featuring Colin Lucas) One of those tunes that spawned it's own unique and distinctive dance. From the early 90's till today, people of all ages can be seen doing the "Dollar Wine!" Follow The Leader - Nigell & Marvinn A hit for the energetic siblings and the first of two "participation" tunes from them on Soca Anthems. Jump & Wave - Preacher After writing hits for many of the top Caribbean artistes, Preacher finally penned a hit for himself with this massive carnival song in 1998 that still sounds fresh today. Pump Me Up - Krosfyah Led by Edwin Yearwood, Krosfyah is one of the premier part bands from Barbados. This track signifies a heavier Reggae influence being used and being combined with soca. Typical of what was to be known as the "Bajan" sound. Movin' - Nigell & Marvinn The second of the Lewis' tunes which rely totally on partygoers following their musical instructions. Seems to have the same effect whether it is ten or ten thousand people "Movin' to the right or Movin’ to the left"! Nani Wine - Crazy Nani Wine helped the rise in popularity of "Soca Chutney" music...Crazy's biggest hit to date. Tiney Winey - Kerwin Trotman Staying true to the original version by Byron Lee and the Dragonairs, this version sees newcomer Kerwin Trotman giving this dancehall classic a new lease of life. Sugar Bum Bum - Steve Sealy Originally a massive hit for the grand master "Lord Kitchener" who passed away in early 2000, this reworking lovingly retains all the vital elements that made the original such a favourite the world over. Hot, Hot, Hot - K P Sunshine Band This soca signature tune, originally a global hit for Monserrat's Arrow, hit the British national charts in the early 80's and sustained exposure through countless use in commercials the world over. This version adds a Y2K feel to one of the most recognisable tunes ever to emerge from the Caribbean. Ah Comin' - The Mighty Power Coming late in his career, legendary calypsonian, The Mighty Power, surprised the calypso fraternity with this soca gem in the early 80's. Recognised by young and old alike, this anthem possesses an eternal quality enjoyed by all.